Aesthetics International welcomes Board Certified Plastic Surgeon, Dr. Fara Movagharnia! With over 18 years of experience in the Atlanta area, Dr. Movagharnia has the reputation of being a perfectionist, which is defined by “one who constantly strives to improve.” He is not happy until he knows he has done his best. Dr. Movagharnia is guided by a principle he learned at an early age “If you are going to do something… do it right the first time.” This simple philosophy has served him well both academically and professionally throughout his life. 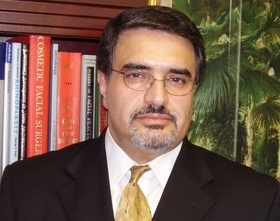 Dr. Movagharnia attended Kennesaw State University and Georgia State University, where he finished four years of undergraduate studies and received his Bachelor in Biology and Psychology with honors. Dr. Movagharnia received his osteopathic medical degree from the West Virginia School of Osteopathic Medicine where he received the CIBA Collections Award for Outstanding Community Service. He completed one year of internship in Atlanta and then full training in general surgery in Detroit, Michigan, where he was the Resident of the Year. He was chief resident during both his general surgery and plastic and reconstructive fellowship. After finishing his general surgery training, Dr. Movagharnia spent two years in Philadelphia being trained by the most renowned plastic reconstructive and cosmetic surgeons in the country and in the most prestigious medical facilities such as the Thomas Jefferson Hospital, Philadelphia Hand Center, Hahnemann University and Medical College of Pennsylvania. His post-plastic surgery training was in micro vascular surgery at the renowned Cleveland Clinic Foundation in Cleveland, Ohio with Dr. Maria Siemionow, who is a pioneer in facial transplants. While in he was in Philadelphia, Dr. Movagharnia pursued further extra specialty training in aesthetic surgery. He concentrated on cosmetic surgeries of the body, such as liposuction and abdominoplasty (tummy tuck) and breast surgeries, such as augmentation, lift and reduction. Dr. Movagharnia enjoys the full spectrum of plastic surgery, focusing on aesthetic surgery of the face, breast, and body and has published numerous papers on aesthetic surgery.